People produce a lot of content. Messages, text files, spreadsheets, presentations, reports, financials, etc, the list goes on. Usually organizations want to have a repository of all this content centralized somewhere (just in case a laptop breaks, gets lost or stolen for example). This leads to some kind of grouping and permission structure. You don’t want employees seeing each other’s HR records, unless they work for HR, same for Payroll, or unreleased quarterly numbers, etc. As this data grows it no longer becomes easy to simply navigate and a search engine is required to make sense of it all. But what if your search engine returns 1000 results for a query and the user doing the search is supposed to only have access to see 4 things? How do you handle this? Check the user permissions on each file realtime? Slow. Pre-calculate all document permissions for a user on login? Slow and what if new documents are created or permissions change between logins? Does the system scale at 1M documents, 10M documents, 100M documents? 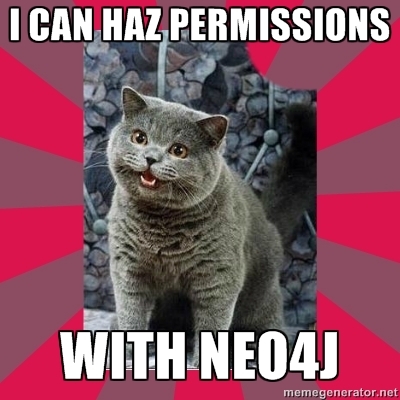 In the Neo4j data modeling examples there is a solution using a graph. 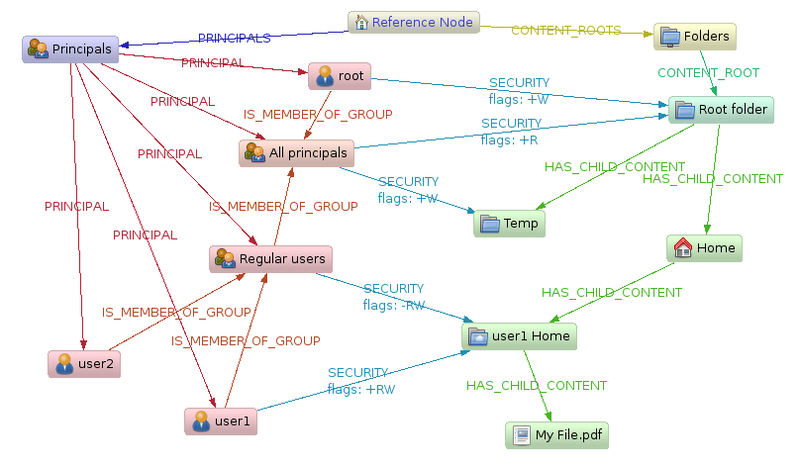 Users have direct permissions to documents (or folders), or via groups. Folders can have many child documents, which can have many child documents and “turtles all the way down”. What files are owned by whom? Who has access to a File? So back to our question. What if the search engine returned 1000 records and we needed to see which of these the user has access to. How can we do this in the graph? Not by starting from the User and traversing to all the possible documents the user has access to (since this could take a very long time in a 100M document graph). Instead we will start with the documents and see if they have a direct permission relationship to the user or the groups the user belongs to. We do this for all the documents, and for those which we don’t have a direct relationship, we move up to the parent folder and try it again. We’ll be smart and merge any documents who share the same parent to reduce the number of checks. Doing it this way, we will traverse thousands of relationships (instead of millions) depending on how deep the document structure goes. I’m going to walk-through the code using the Neo4j Core API inside an unmanaged extension so it can be accessed via REST and I’ll show you how I wrote a couple of performance tests (one random and one static) as well as how I generated our test data. This project is open source and available on github. The CreatePermission method is a little bit different since we’re creating a relationship. Our permissions method takes a string parameter that contains a user id a comma, and a space separated list of document ids. We take the input and initialize some variables that will hold our data as we traverse the graph. We are going to iterate through these document nodes. In the loop, we check to see if the user node has a direct relationship to the document and if so add it (and any possible children documents to a “document” list which we will return at the end. If we get to the end of our documents, we switch to the parents of our documents and iterate through those until there are no more parents (reached the root folder of our document tree). But how fast is it… and does it scale? To find out we’ll need to create a larger graph and a set of performance tests. Stay tuned for part two. Published at DZone with permission of Max De Marzi , DZone MVB. See the original article here.